This is a comprehensive agreement between a company providing bookkeeping and accountancy services and a client business. 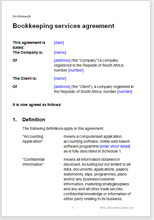 This agreement sets out the relationship between a bookkeeping company and a client business. The bookkeeping company is likely to provide a range of services, from record keeping to accounts preparation, financial forecasting, budgeting and management reporting. The document is suitable for one-off project work, such as putting a new accounting system in place, or for on-going service provision. The most striking feature of this agreement is the optional provision for the license of intellectual property developed by the bookkeeping company. You are likely to develop tools that save you time, or allow your client to work without you. These might be report templates, or spreadsheets containing macros, or a process for collecting data. This IP is valuable (if only at the replacement cost of time), so you should make sure that you own the rights to it, and can reuse it for other clients. This contract contains provisions that ensure that IP developed in the course of working for a client remains yours, and not your client's. Your client will be aware that when the contract terminates, he loses the benefit of the use of the IP. A limitation of liability provision sets out the boundaries of your responsibilities and it should limit the amount of damages that the client can seek. We include tough terms to help ensure that your client does not pursue you for something for which you were not responsible. This document is for a company. If you are a sole trader, you will a contract for services that emphasises that you are self-employed. See our bookkeeping terms and conditions template. If you offer business consultancy services as well, you might consider using one of our consultancy agreements in place of this agreement for those services.